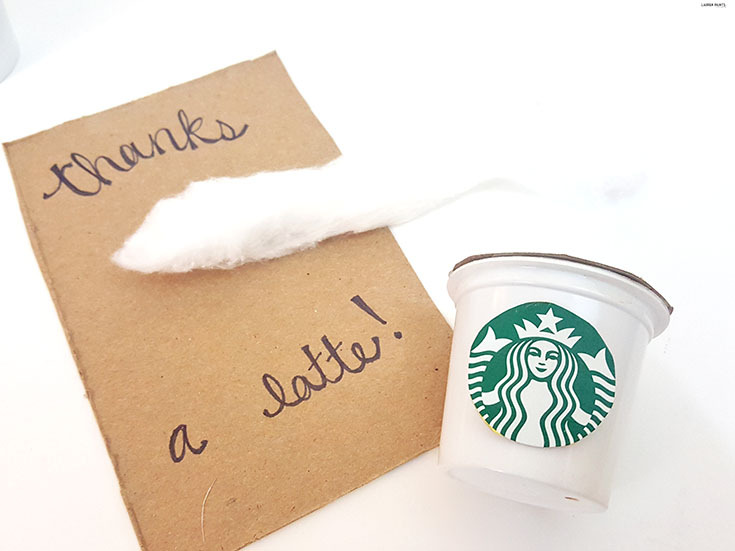 Summertime Starbucks: DIY Thank You Card Upcycled K Cup Project + Coffee, Chai Tea, or Iced Tea? 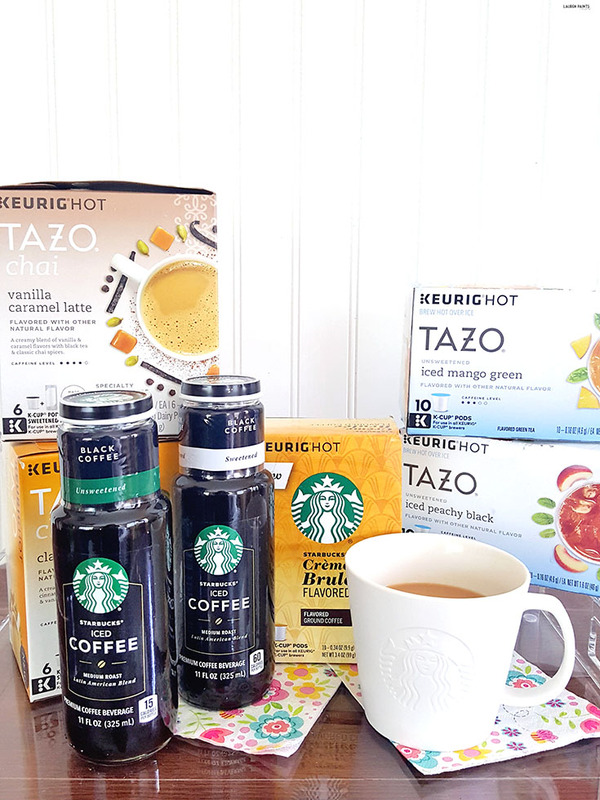 Thanks to Starbucks for sending over these awesome K-cups and other beautiful items to include in my post today and a big thanks for offering a great affiliate program that I've linked below, regardless all opinions expressed below are my own. Summer & Starbucks go together hand-in-hand, in my mind... Well Starbucks goes with every season and that's why I'm such a big fan. 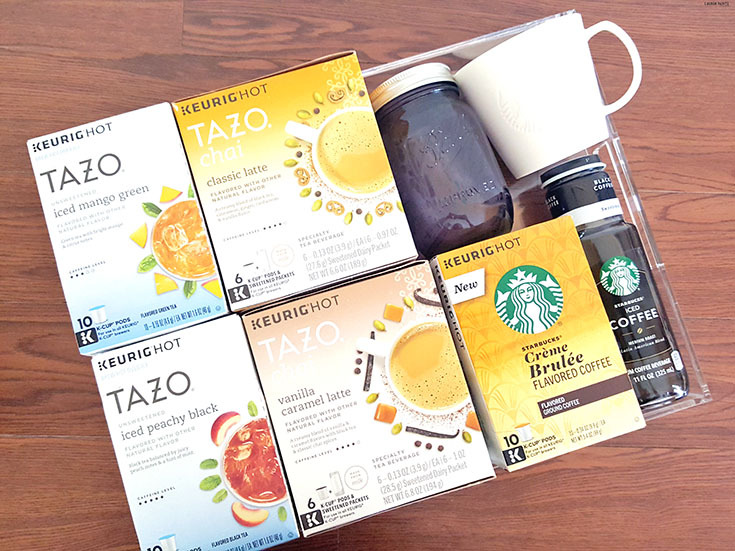 With so many amazing flavors and such a versatile line up of coffees and teas, I'm a bit of a Starbucks junkie... so I'm having to limit my intake while carrying Delainey and I can't wait to get back into my multi-cup routine soon. 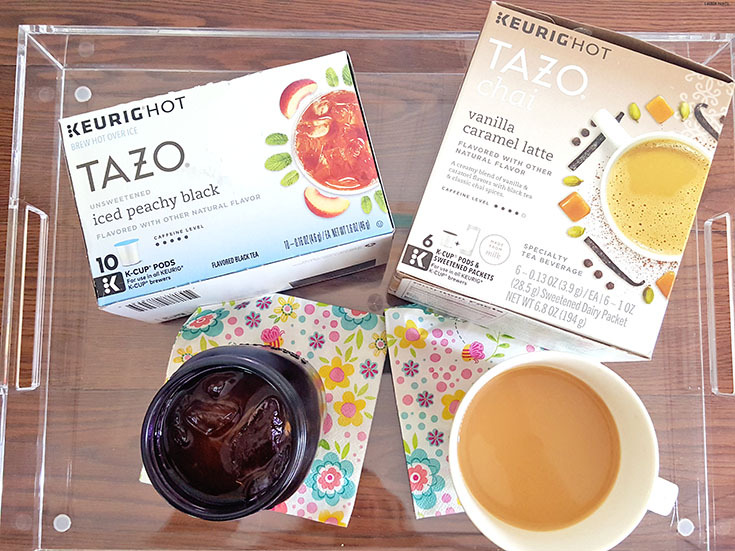 While I'm not drinking more than a cup a day currently, I was more than overjoyed to dish out some coffee, chai tea, and iced tea goodness at my latest little get-together with our buddies so we could sample all of the delicious flavors Starbucks sent me to try out this summer. 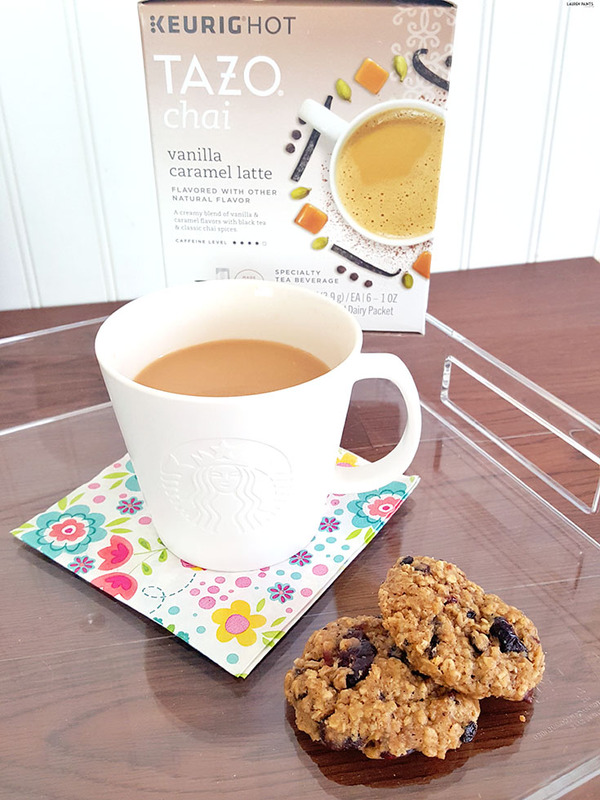 I sipped on a glass of the Tazo Chai Vanilla Caramel Latte while I made a cup of Creme Brulee flavored coffee for my hubs, my friends each wanted to try something new so I served up a glass of the Tazo Iced Peachy Black tea and another Tazo Chai Vanilla Caramel Latte for each of them... paired with some delicious vegan, oatmeal cookies! We were all so impressed with the "homemade" beverages, I think I've officially earned the title of "Barista" at this point... Lucky for me, making delicious Starbucks coffee and tea at home is as easy as pressing a button. While making the coffee is super easy and enjoyable, the same could be said about having great friends. Our buddies blessed us with so much adorable stuff for Delainey recently, I had to make something for them in return. 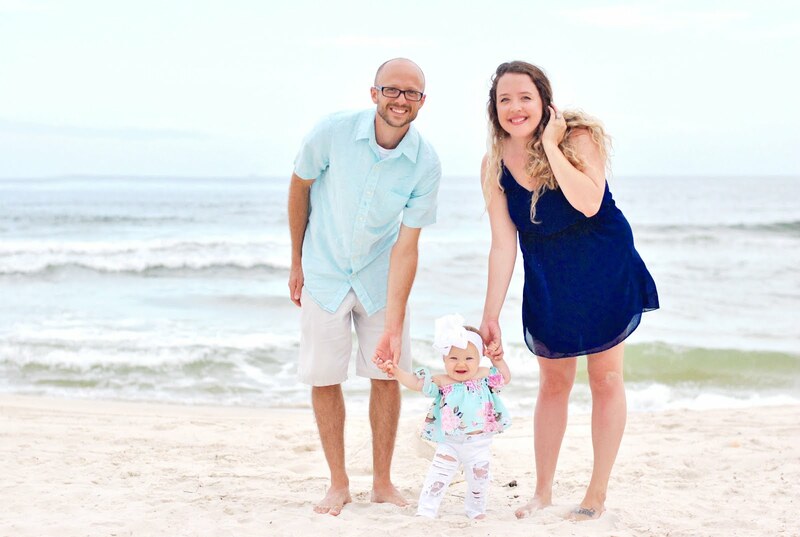 I couldn't think of a thing they needed so I decided making them a little thank you card with a personal touch was the best way to thank them, with a little gift card attached to the back - I'm sure they will be more than happy with their little surprise. 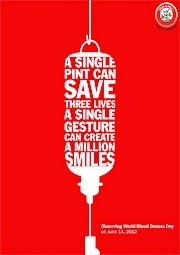 Do you want to tell some one "Thanks a latte" for something amazing they've done for you recently? 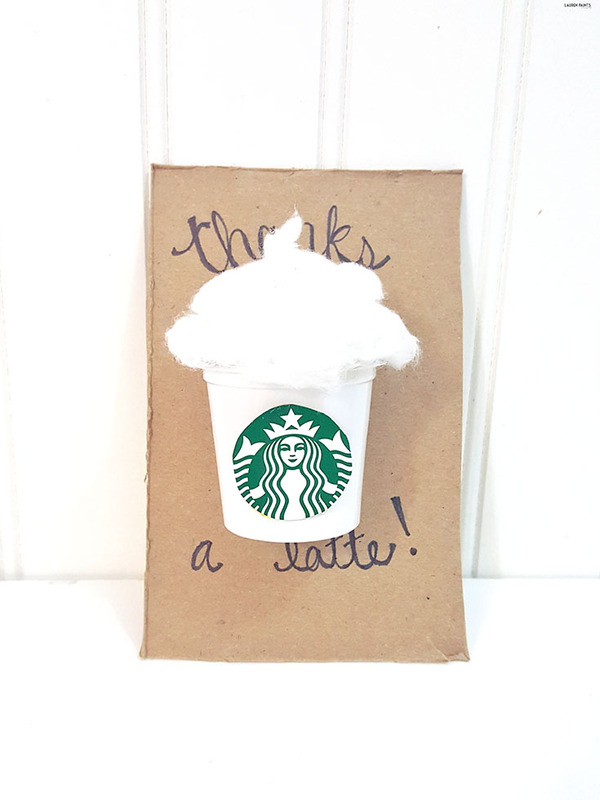 It's as easy as making a k-cup to make this adorable little card! First things first, to get this project started go ahead and plug in your glue gun and warm it up. 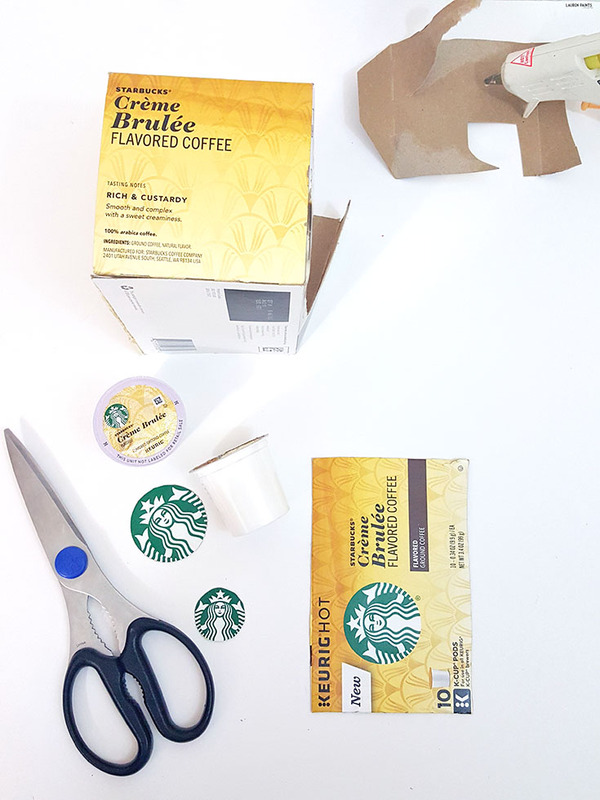 Now go ahead and cut out the Starbucks logo from the Keurig box, being sure to leave the outer side without perforation untouched. 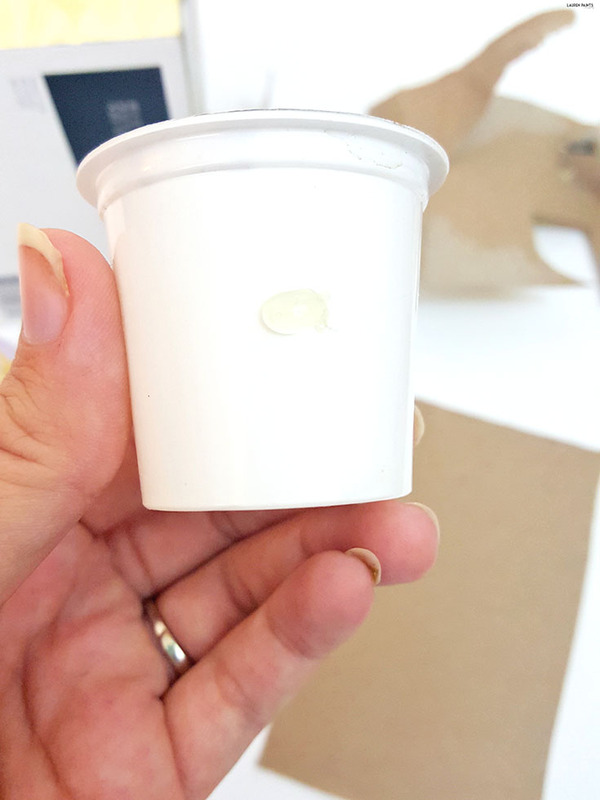 Your next step is to hot glue the Starbucks logo to the side of the K-cup. 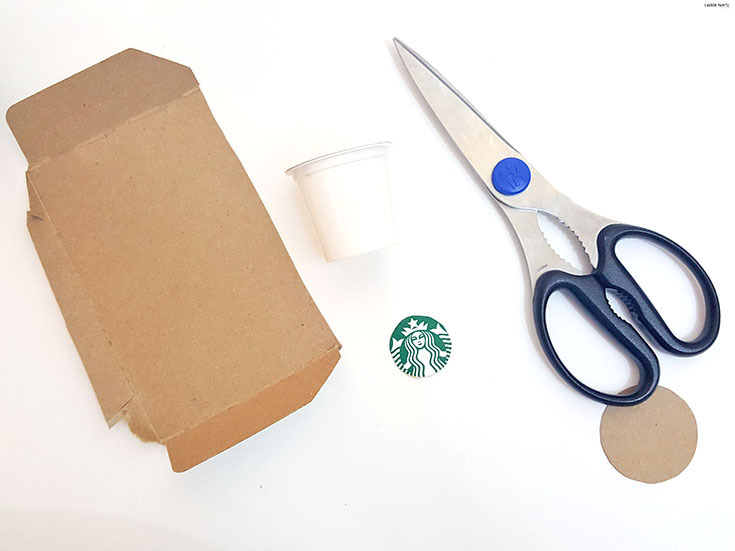 Following that, quickly use the top of the K-cup to measure and cut out a circle piece of cardboard from one of the side pieces of "scrap" of the Keurig box, be sure to cut it large enough to cover the entire top of the K-cup. Glue this piece to the top once it's trimmed to fit. Next you'll want to let the glue on these pieces dry and write a cute thank you message on the untouched, un-perforated side of the box. 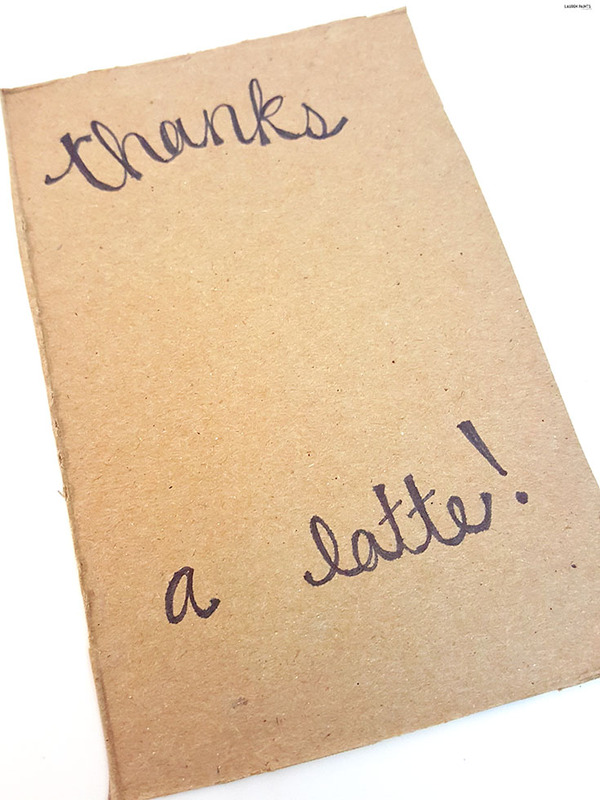 I wrote "Thanks a latte" but you could go with something like "Words cannot espresso my thanks" or whatever punny coffee line you want! Once your message is written, go ahead and unravel the cotton balls. The brand I bought comes apart fairly easily so they became long strands within seconds. You'll want to have enough to "swirl" on the top of your cup to mimic whipped cream. My suggestion is to start forming it before gluing to insure you get the look you want with minimal effort. 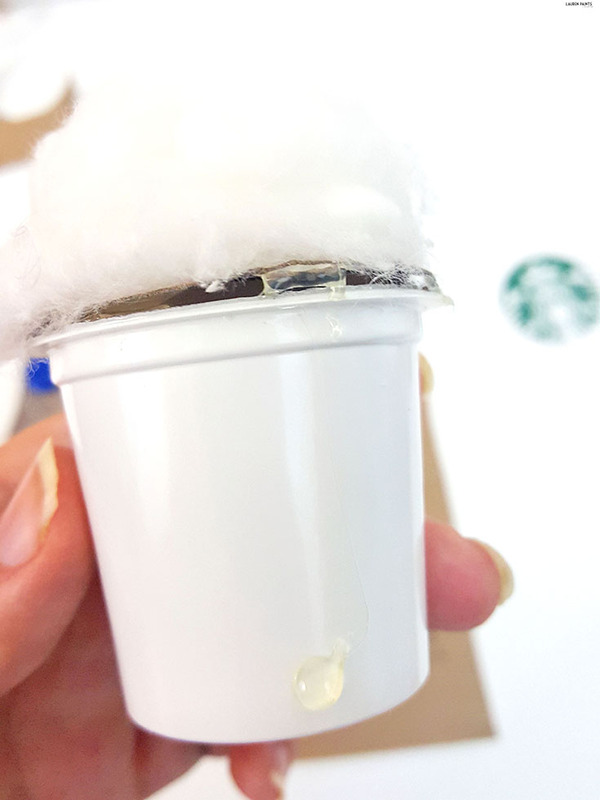 Now use your glue gun and glue the cotton balls/whipped cream to the top of the cardboard covered K-cup opening. 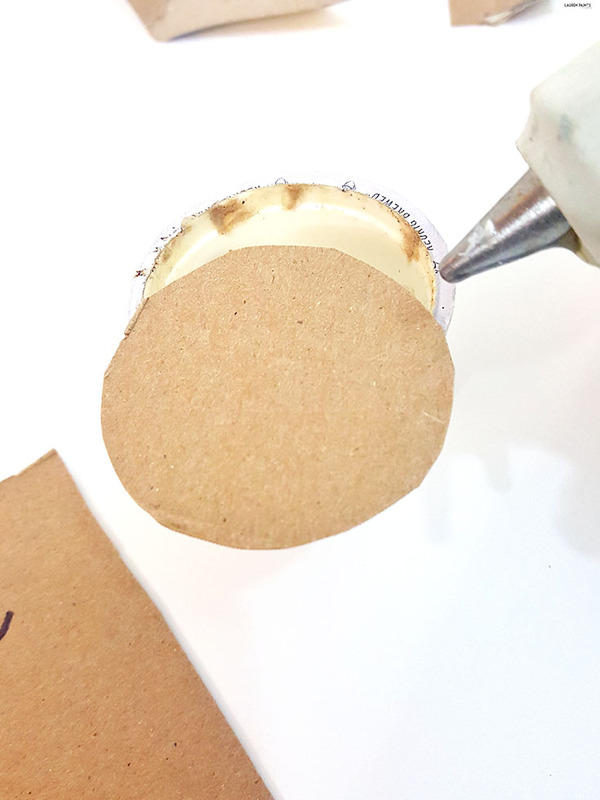 Take a quick second and add a few dots of glue to the back of the K-cup/Starbucks mini-cup, pressing it onto the piece of cardboard that has the thank you message written. 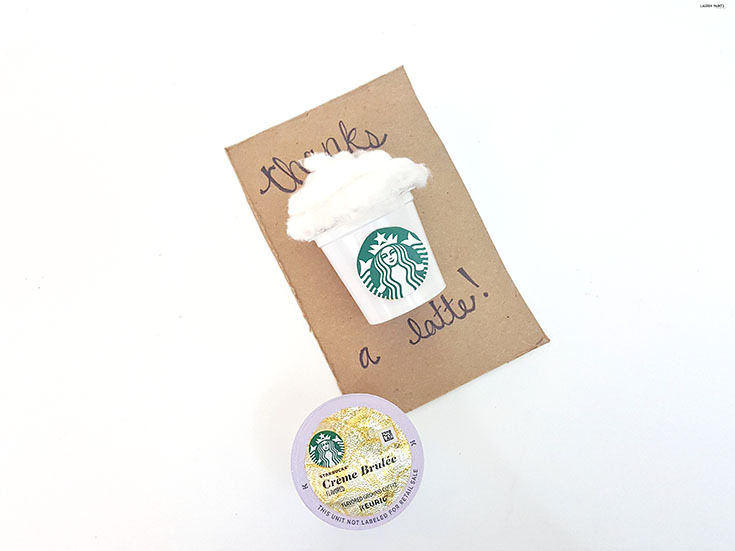 Now hand one of these bad boys out to every Starbucks loving friend you need to thank and they may just be thanking you for the adorable card showing your gratitude! Plus, don't miss your chance to save some money... Click here & save Up to 30% on New Summer Markdowns at Starbucks.com! Bargain Shop From Your Phone with PatPat!